In October of 2016, EIS, Inc., part of the Fortune 200 Company, Genuine Parts Company, acquired Communications Products and Services. CPS now joins the GCG’s Broadband team as well as Electro Wire, Cobra Wire & Cable, Seacoast and Connect-Air. CPS is now part of the Genuine Cable Group. CPS has been in business for nearly thirty years and is a National Distributor of outside plant product solutions for both aerial and underground network construction projects. The clients we serve build infrastructure used for broadband cable TV and data, wireline and wireless network service providers and many other users of video, voice and data networks. With a large and varied product portfolio, CPS is uniquely positioned to meet needs of a wide-range of customers. Throughout our history, we have supported large-scale construction projects for the nations’ largest MSO’s, electrical power companies, municipalities and state-funded development contracts as well as the affiliated contractors and construction firms. During our three-decade tenure, we have developed partnerships with industry leading manufacturers known for quality, innovation and that offer exceptional expertise in product production. In today’s competitive marketplace every broadband network must meet or exceed the customer’s mission-critical data transmission needs. CPS offers the capability and product solutions essential to capture market share and grow revenues while keeping costs low. CPS maintains over an acre of land for offices, storage, and keeps considerable inventory available in an effort to get product delivered to your site quickly. In addition, our footprint (see map) has grown dramatically as part of the Genuine Cable Group team. Free delivery is available within the Colorado Front Range region. It’s not about us but about you, our customers. Because you have trusted us to be your supplier, our goal is to exceed the expectations of every customer and process every purchase order expeditiously, accurately, at the lowest possible cost. EIS, Inc., a North American Distribution Leader in the electrical industry, and part of Genuine Parts Company, a Fortune 200 Company, acquired Communications Products & Services in October of 2016. CPS is part of the Genuine Cable Group which includes Seacoast, Electro Wire and Connect-Air, plus GCG Broadband and GCG Assemblies. 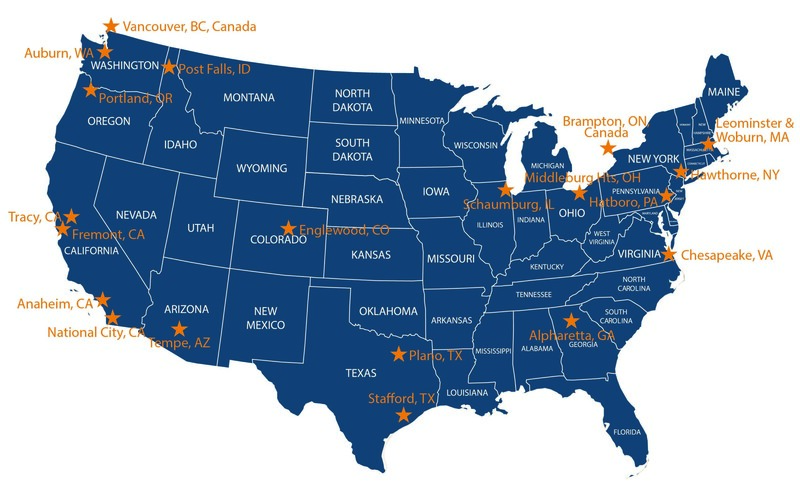 Our combined companies bring strength and position to the wire & cable marketplace across the United States and Canada. CPS constantly strives to be a leading national distributor. We’ve built our reputation by following our corporate values and by partnering with our customers. Our customers are our business and always come first. Maintain a constant focus on our customers' needs. Put forth the extra effort in solving customer issues. Striving to find a workable solution to every problem with uncompromising standards. Provide quality products and services for the lowest cost. CPS consolidates complex material requirements from multiple manufacturers under a single purchase order. For large scale projects materials can be staged and delivered on a schedule to help better manage cash flow. We listen, learn, and implement processes that helps both CPS and our customers improve purchase order accuracy, forecast requirements and reduce project risks. Our extensive history – Nearly three decades of serving the fast-paced, complex requirements of broadband data, voice, video, and wireless communications industry.